One of the things that make bad money habits hard to break is that we don’t even recognize we have them in the first place. Just as with any other issue we may have in life, the first step to start improving it is to spot it and then turn it around. 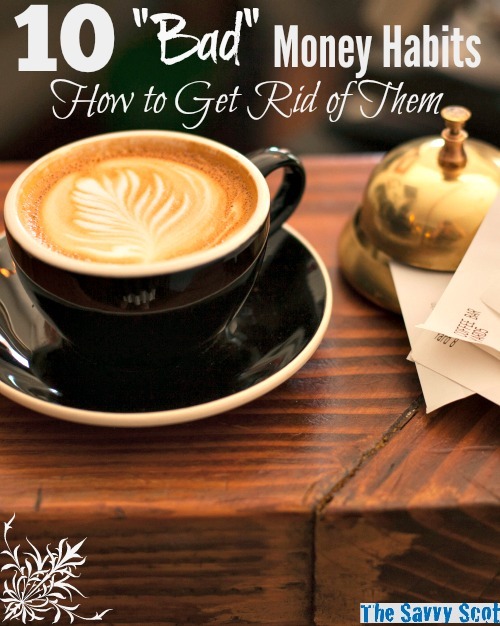 These 10 bad money habits may be draining your wallet, however, you can start breaking them right away with the advice given. Credit cards make it easy for us to become impulsive buyers. However, to pay for simple things such as a hamburger in 10 installments is a pretty bad habit some of us may have. Credit cards have some of the highest interest rates out there plus other fees. To protect your capital, first of all clear your balance using whatever monetary resources you have right now. Then, start paying off your credit card debt every month. It takes discipline but you will notice it’s one of the best habits you can acquire, financially speaking. Imagine how much money you would save in a year if you were to use a coupon every time you buy something. Online coupon sites are available by the handful. They offer coupons from many online and offline stores. It just takes a few minutes to surf the net and you can start using coupon codes on your favorite shops. You can also try downloading coupon apps and checking them on a daily basis to plant the new habit. According to a survey made by YouGov for Zurich, 75% of British citizens are worried about running out of money in retirement. Living life in the fast lane and not worrying about your financial future may be a hard habit to break for some people. To get a new mentality, visualize yourself in your 70s. Then imagine how you want to live like. Experts recommend that you save at least 10% of your annual income for retirement. If you aren’t saving this amount, increase it by 1% each month until you finally reach it. Spending money mindlessly is the easiest thing to do. On the other hand, tracking your spending requires self-discipline. If you don’t know where your money is going every month, you won’t be aware if you are spending too much or not. You can start by tracking it in an Excel spreadsheet or just a normal notebook at the beginning of the next month. Every day (for 30 days) list the things you bought and the price you paid for them. Then classify them into categories and see if you can decrease any expense starting from the following month onward. Rip-off cash machines haven’t been outlawed. They are still out there and some of them even charge a whopping £10 for a single transaction! Only use an ATM that has your bank’s logo printed in it. Investing in the stock market is simple, right? Buying low and selling high is easier said than done. If you want to invest, make sure you read a couple of books in the matter beforehand and try out with demo accounts before plunging into the real market. An emergency fund is a must. Period. We all know shopping is more fun than having money in your savings account. However, in times of crisis an emergency fund will provide you with peace of mind. To get into the habit of saving for one, start saving at least 5% of your monthly income. Do this until you have at least a fund equivalent to three months’ worth of expenses. It will also help if you read our blog post “Ten Ways to Build an Emergency Fund”. Sure, £4 is not much. However, when that amount is multiplied by all workdays in a year it adds up to over £1000! And this amount doesn’t even include tips. You can change your latte habit by making coffee before going to work. If this doesn’t sound very luring, you can buy yourself an espresso maker for £600 and have a high quality latte at a fraction of the cost. If you don’t ask you will never get it. Most people that ask for a raise will get something even if it’s not the amount they expect. They may get a salary increase or other incentives. If you are timid and you deserve a raise, it’s time to come up with the courage to ask for one. Again, asking for one if you deserve it is realistic both from the side of the employee and the side of the employer so there’s no reason to not do it. Monthly services such as cable TV, internet, insurance policies, and phone lines are recurrent expenses that you will have to carry on pretty much for the rest of your life. Accepting the first offer that comes from any company is a good way to throw some of your money away. Thus, spend several minutes calling the main companies in the area and negotiate for lower prices if possible.